PittPharmacy students attended the July Student National Pharmaceutical Association/National Pharmaceutical Association (SNPhA/NPhA) 2018 National Convention. The chapter was recognized for several achievements during the school year over the conference weekend. The incoming Chapter President, Kathy Monangai, (Class of 2020) was appointed to the 2018 National Elections Committee. 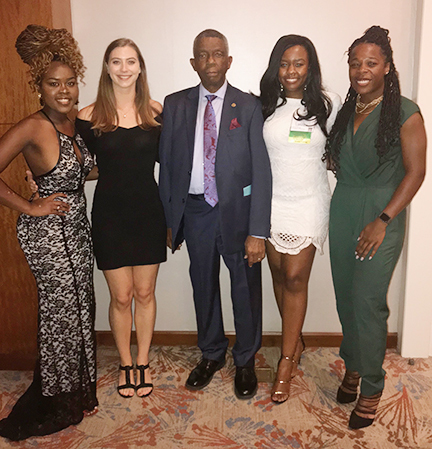 This national committee consists of representatives from each of the five SNPhA regions, the National President-Elect, and the National President. Monangai represents the University of Pittsburgh School of Pharmacy as the Region 1 Representative. The National Elections Committee interviewed candidates from every region and eventually slated them to be vote on by the National House of Delegates. After the election, each winner became an official member of the 2018-2019 National Executive Board.